Year-round swimming free airport transit and Wi-Fi and easy I-5 access lead the way to the non-smoking Holiday Inn Bellingham. At this four-story Holiday Inn 153 rooms include free Wi-Fi flat-panel TVs USB docks and DVD players plus pillow menus and kitchenettes. Guests can also opt for suites featuring sofa beds walk-in showers and full kitchens. Swim year-round in the heated indoor pool or relax in the sauna and hot tub. After working brawn and brain in the fitness and business centers toast to a job well done in the in-house lounge. On-site parking and airport shuttle service are free. Pets are allowed for an additional fee. 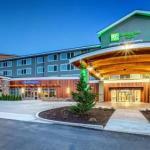 Off I-5 the Holiday Inn lies around the corner from Bellingham International Airport and six miles north of Western Washington University. Guests can stroll through the quaint streets of downtown Bellingham after a 13-minute drive and cross the Canadian border in 22 miles north. Guests are also within two hours north of Seattle and a 56-mile drive west of the Mt. Baker Ski Area.